​ through volcanic eruptions, or as the result of human activities, such as the spilling of oil or disposal of industrial waste." Incidental Pollution - this is one off pollution typically caused by a one off disaster or even eg. Chernobyl nuclear meltdown. Sustained Pollution - This is persistent long term pollution typically caused by factories or indursty. 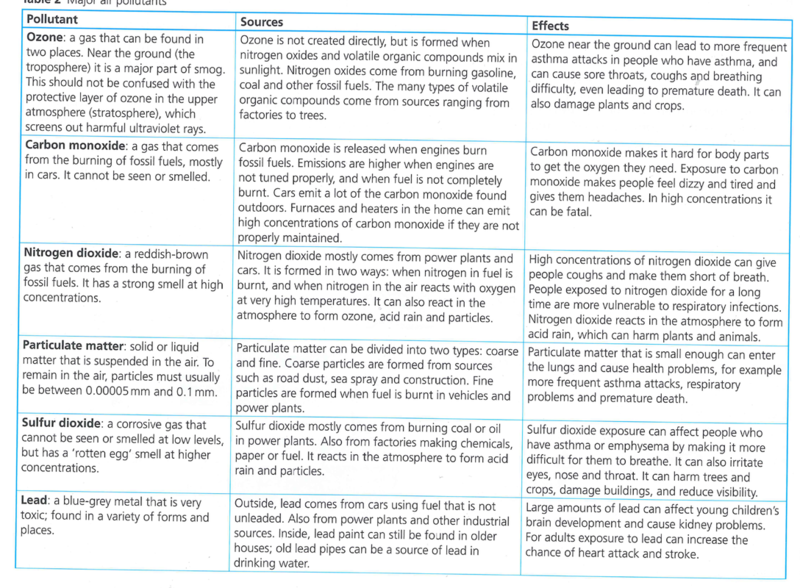 Using the information below and your Geography textbook page 226 to 228 create a set of notes on the different types of pollution. Pay special attention to Air pollution and table 2 on page 226. Land pollution is responsible for damage done to natural habitat of animals, deforestation and damage done to natural resources, and the general ugly-ing up of our communities. These kinds of environmental pollution are linked to health issues in humans, animals and plant-life. Noise pollution can be disruptive to humans' stress levels, may be harmful to unborn babies, and drives animals away by causing nervousness and decreasing their ability to hear prey or predators. It can even disrupt breeding patterns. Light pollution uses more energy, may affect human health and our sleep cycles. It can also affect animal behaviour. The Green House effect: an atmospheric heating phenomenon, caused by short-wave solar radiation being readily transmitted inward through the earth's atmosphere but longer-wavelength heat radiation less readily transmitted outward, owing to its absorption by atmospheric carbon dioxide, water vapor, methane, and other gases; thus, the rising level of carbon dioxide is viewed with concern. 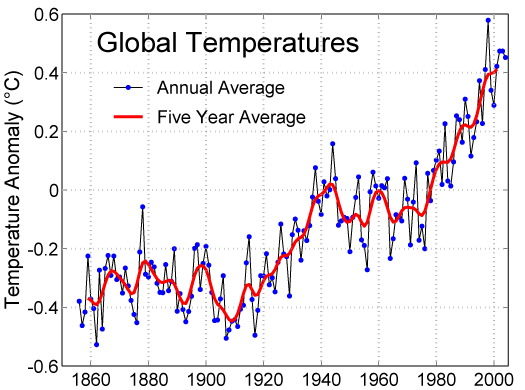 Global warming: a gradual increase in the overall temperature of the earth's atmosphere generally attributed to the greenhouse effect caused by increased levels of carbon dioxide, CFCs, and other pollutants. This is caused by human activity. Climate change: a change in global or regional climate patterns, in particular a change apparent from the mid to late 20th century onwards and attributed largely to the increased levels of atmospheric carbon dioxide produced by the use of fossil fuels. ​There have been observed changes in precipitation, but not all areas have data over long periods. Rainfall has increased in the mid-latitudes of the northern hemisphere since the beginning of the 20th century. There are also changes between seasons in different regions. For example, the UK's summer rainfall is decreasing on average, while winter rainfall is increasing. There is also evidence that heavy rainfall events have become more intensive, especially over North America. ​The Greenland and Antarctic ice sheets, which between them store the majority of the world's fresh water, are both shrinking at an accelerating rate. Using the animation below explain how the greenhouse effect works. Soil erosion is a naturally occurring process that affects all landforms. In agriculture, soil erosion refers to the wearing away of a field's topsoil by the natural physical forces of water and wind or through forces associated with farming activities such as tillage. 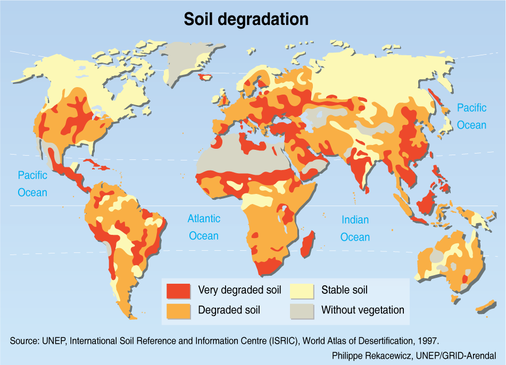 Soil degradation is the decline in soil quality caused by its improper use, usually for agricultural, pastural, industrial or urban purposes. 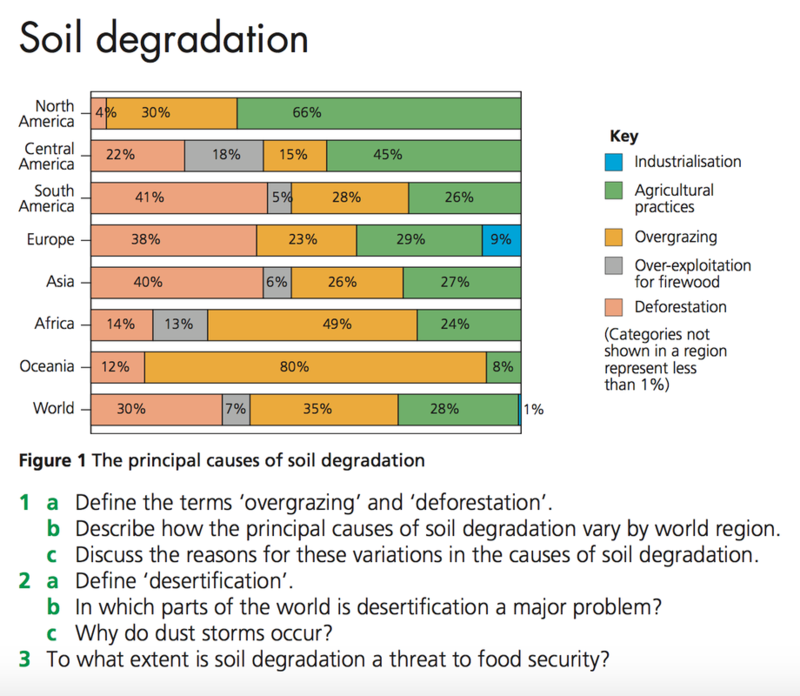 Soil degradation is a serious global environmental problem and may be exacerbated by climate change. Development: refers to the standard of living and quality of life of its human inhabitants. In this context, development is a process of change that affects people's lives. It may involve an improvement in the quality of life as perceived by the people undergoing change. Sustainable development: is development that meets the needs of the present, without compromising the ability of future generations to meet their own needs. Solar Energy The greatest advantages of solar energy are that it is completely free and is available in limitless supply. Both of these factors provide a huge benefit to consumers and help reduce pollution. Replacing non-renewable energy with this type of energy is both environmentally and financially effective. Wind Energy Wind energy is another readily available energy source. Harnessing the power of wind energy necessitates the use of windmills; however, due to construction cost and finding a suitable location, this kind of energy is meant to service more than just the individual. Wind energy can supplement or even replace the cost of grid power, and therefore may be a good investment and remains a great example of sustainable development. Crop Rotation Crop rotation is defined as “the successive planting of different crops on the same land to improve soil fertility and help control insects and diseases.” This farming practice is beneficial in several ways, most notably because it is chemical-free. Crop rotation has been proven to maximize the growth potential of land, while also preventing disease and insects in the soil. Not only can this form of development benefit commercial farmers, but it can also aid those who garden at home. Efficient Water Fixtures Replacing current construction practices and supporting the installation of efficient shower heads, toilets and other water appliances can conserve one of Earth’s most precious resources: water. Examples of efficient fixtures include products from the EPA’s WaterSense program, as well as dual-flush and composting toilets. According to the EPA, it takes a lot of energy to produce and transport water and to process waste water, and since less than one percent of the Earth’s available water supply is fresh water, it is important that sustainable water use is employed at the individual and societal level. Green Space Green spaces include parks and other areas where plants and wildlife are encouraged to thrive. These spaces also offer the public great opportunities to enjoy outdoor recreation, especially in dense, urban areas. According to the UW-Madison Department of Urban and Regional Planning, advantages of green spaces include, “helping regulate air quality and climate … reducing energy consumption by countering the warming effects of paved surfaces … recharging groundwater supplies and protecting lakes and streams from polluted runoff.” Research conducted in the U.K. by the University of Exeter Medical School also found that moving to a greener area could lead to significant and lasting improvements to an individual’s mental health.